Blurb: A crime that rocked a city. A case that stunned a nation. Based on the United States’ first recorded murder trial, Eve Karlin’s spellbinding debut novel re-creates early nineteenth-century New York City, where a love affair ends in a brutal murder and a conspiracy involving Alexander Hamilton and Aaron Burr erupts in shattering violence. When I was first pitched this book I was immediately intrigued. I love a good historical fiction novel based on a true crime story from the past. It takes two of my favorite things – true crime/mysteries and history – and blends them together in a way that I love to read about! So I was really excited to read this book! Overall, it wasn’t necessarily a bad book. But I felt like the blurb might have been a little bit misleading. I expected more Hamilton/Burr than I got out of this book. I also wasn’t quite prepared for the sheer amount of political references. But I will say this, I loved the scene that was portrayed by Ms. Karlin. She really brought nineteenth-century New York City to life for me. And definitely made me appreciate the modern conveniences we have and take for granted! So while this story was a little more politically involved than I had been prepared for, I still enjoyed it quite a lot. I learned about a murder trial I had never heard about before. I felt like I was walking the streets of New York City in 1799. And it was just an overall entertaining read. About the Author: Eve Karlin was born and raised in New York City. She is a graduate of Colgate University, where she studied literature and creative writing with Frederick Busch. Karlin worked in publishing for more than a decade in marketing, at Random House, Newsweek, and, later, as a foreign book scout with clients in the United Kingdom, Italy, Holland, Brazil, and Japan. She has had several short stories published in The East Hampton Star and has been a contributing writer for Patch.com. She lives in East Hampton, New York, with her husband and their sixteen-year-old triplets. 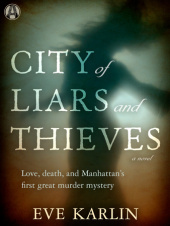 City of Liars and Thieves is her first book. GIVEAWAY! There is also a giveaway available in conjunction with this tour. The winner will receive a $25.00 gift card to the e-book retailer of their choice and one copy of City of Liars and Thieves. PLEASE CLICK HERE TO GO TO THE GIVEAWAY PAGE. I’m a big fan of modern conveniences … I’m rather spoiled in that way! I do love it when an author makes me see and hear and feel a different time and place. It makes me appreciate MY time even more!